Launchpad couldn't import bug #12276 from Linux Kernel Bug Tracker. On resume from suspend in Ubuntu 8.10 (Intrepid Ibex) the ATA driver throws a series of exceptions, as a result the filesystems can not be accessed and the computer needs to be rebooted. Hibernate, however, does work and does not have this problem, suspend / resume only. The linux kernel version is the latest 2.6.27-7. * Update 16th of May 2009 * The problem remains unchanged under Ubuntu 9.04 (Jaunty Jackalope). There are a variety of other error messages thrown about ext3 file systems not being to be re-mounted, but I haven't been able to capture those yet. I'm running a fresh copy of Ubuntu 8.10 (Intrepid Ibex), with the latest updates, on a reasonably new HP Pavilion dv5 (1075er) notebook. Originally I posted my problem under bug #158050 but later I realised that this was for an older kernel version. Then I thought that bug #273323 would be a better fit, but that has since digressed into a KDE discussion, entirely irrelevant to my problem. I've looked at every Intrepid suspend / resume bug listed and none are specific to my distribution version, kernel version or hardware so I'm starting a new one. * Update 18th of May 2009 * There is also evidence, anecdotal and otherwise, to suggest that the same problem is present on HDX and some other models of HP laptop. The dmesg output. I wish there were some way we could add multiple attachments on launchpad. zip / tar balls just don't cut it. I will greatly appreciate any help that can be given. I've tried a lot of solutions out there and none have helped or changed the outcome in any way. As you can appreciate, suspend / resume is a really important feature on a laptop / notebook computer. I can confirm this problem. I have a HP laptop (dv7-1050ef) and i have the same problem. Maybe a problem with acpi bios ? The problem still persist with kernel 2.6.28-rc6. Hibernate works fine but suspend to ram not. These lines don't exist in non-RAID boot. Adding libata.noacpi=1 at kernel command line for 2.6.28 kernel has no effect. Adding pci=nomsi solve sound resume, but has no effect for the sata. Thanks freak007 for contributing to this bug report. Have you had any luck with this bug yet? I'm quite convinced it's a kernel driver issue, which puts it out of my hands for an easy fix. I can't understand why so many laptops can have the same boring old Intel hardware yet everyone seems to have their unique problems. Is it, perhaps, the HP BIOS that is to blame? Just tried updating my HP BIOS from F.09 to F.11 but resume from suspend is still broken; the latest kernel update (2.6.27-9.19) has had no effect either. freak007 has confirmed the same problem. Please excuse me if I'm not doing the right thing by confirming this. the last bios update from hp (F21) solves the problem ! paul_swanson, your problem is fixed for you too ? Well, unfortunately I don't have that BIOS update available for mine (even though the machine is practically identical to yours less a few inches of display) so I'm still at the mercy of HP or some philanthropic kernel boffins. So I'm a little sad. Suspend / Resume is really important on laptop computer. I must add that aside from this giant hole, the installation of Ubuntu was almost perfect (Wireless / Video / Hot keys etc..) and definitely FAR less painful than Vista was (which took a whole evening of downloading drivers). So ... if you're out there and reading this with the same problem ... don't be shy, add your name to the list! 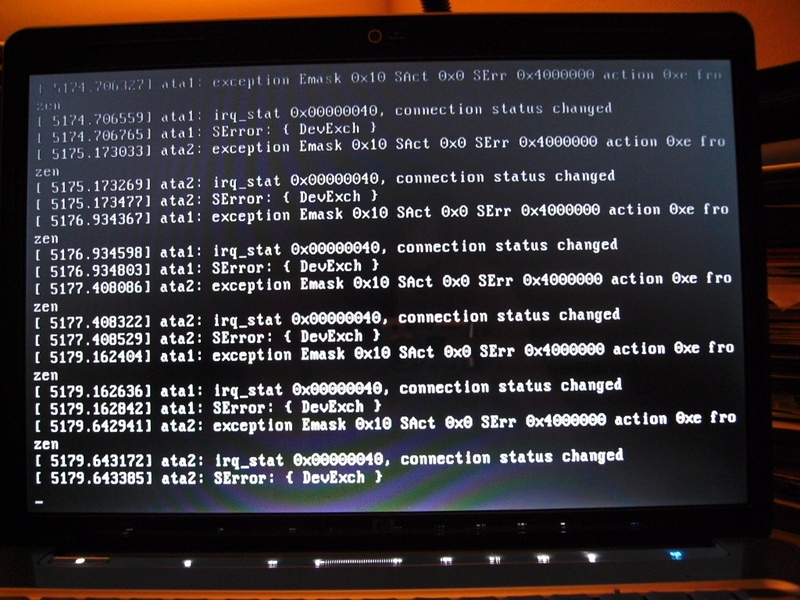 I can confirm this problem on my dv5t with BIOS fc11. Note that the kernel bug listed above has been closed since the problem was fixed on the dv7 with the BIOS update. I've contacted HP about whether we can expect the changes made for the dv7 BIOS to be implemented on the dv5t. I get the problem with both 32-bit and 64-bit Ubuntu. Booting from a USB flashdrive of either version of Ubuntu 8.1 resume "works", but generates the same errors and the HD in the system is no longer accessible. Upgrading to just the Jaunty kernel doesn't fix anything. In the process of upgrading to the entire Jaunty install now to see if that makes a difference. I'm planning to open a new kernel bug (or reopen that older one) in the near future. Although freak007 was able to fix theirs with a HP BIOS update it was not a dv5, and there is no such magic bullet available yet. Additionally, the dv5 suspend / resume works 100% under Vista so we know that it is not entirely the fault of HP, there is clearly a way of getting to work without a BIOS update. Ubuntu puts the laptop into a suspend state that requires the power button to be pressed for resume to be triggered, whereas Vista only requires a keystroke to reactivate. Perhaps the suspend state that Ubuntu uses is just not the right one for a dv5. Does anyone else find this to be so? That's an interesting note. My mom has a Vaio laptop (don't know the model number off the top of my head, but it's a C2D so reasonably new) that also only resumes with a power button press. All the other laptops I've used with Linux resume on a lid open, so I just assumed that was a Vaio specific bug or a problem with her machine (it was a refurb). If there's a difference in sleep modes related to the power-button-to-wake phenomena, that would be an avenue to explore. I'm facing with this problem too as explained here https://answers.launchpad.net/ubuntu/+question/51749/+index. Actually it seems to impact many owners of dv5 notebook series from HP. Bill Liming: I think you may find that the behaviour on your mum's Vaio is a question of manufacturer configuration, not a bug. But, please experiment with your dv5 and leave the results here, also please include the error messages you are getting on resume. Thanks. Vincent: Welcome, unfortunately. I've left a post on the question you mention in order to attract some traffic this way, the more numbers the more chance of attracting some help I figure. Also, could you leave some detail on the exact model of your laptop and the error messages you get here. Thanks. Everybody else: I think Bill is right, we should each contact HP support and request that the suspend / resume feature be looked into for the next BIOS update. I plan to open / reopen a kernel bug tomorrow as it's still plausible that the current kernel approach to the resume method is flawed in some way; it does, after all, work under Vista. HP support's response to me was that they don't support linux on Pavilions, period, so I'm not sure how likely it is that this will be fixed by them other than accidentally. Also, my dv5 is probably going back to HP for other reasons, so I won't be able to follow up further. I like to point out this link http://hardware4linux.info/computers/sysinfo/3637/ to let anyone interested have some details of my hardware configuration. And as I mentionned in answer to the question i previously refered to, when coming back from suspend to ram, the process stops to a black graphical screen with movable cursor - but nothing more - and when i switch to a console by hitting CTRL+ALT+F1 the terminal is filled with the above error messages. I'm using a HP DV5 1073ez and I have exactly the same the same problem. ata2: exception Emask 0x10 SAct 0x0 SErr 0x40000000 action 0xe frozen. And i also think that it is better to correct the bug in the kernel rather than asking hp to update the BIOS. I have also the problem with HP Pavilion DV5t-1000. As neub, I think the kernel should be fixed there. From what I've read on the above wiki page, the problem is likely not to lie with the power management drivers but some other hardware driver, maybe the SATA controller in our case. Unfortunately, when ever I follow the instructions for running a PM trace I don't get any extra clues, other than what's expected. Assigning bug to the Ubuntu Kernel Team now that there are enough confirmed cases of this behaviour. I was having the same problem (this error: irq_stat 0x00000040, connection status changed) when waking up from suspend, and I'd like to confirm that updating the BIOS to F21 solves the problem and everything is fully functional afterwards. Unfortunately, it is in a dv7-1080es. I ran a test suspend on booting that I read about in the kernel documentation and got a curious result. So I hit the power button and it shut itself down (while the screen remained blank). I'm sure it resumed, somewhat properly, because it was able to WRITE the kernel log file. Kern.log had an entry "PM: Finishing wakeup. ", evidencing something of a suspend / resume event and subsequent hard drive activity. I guess you could call that a partially successful suspend / resume. It is worth reiterating that this was a kernel test suspend run during the boot process. I have the HP Pavilion dv-5 1138tx, and I can confirm to having this exact problem. I am using 8.10, fully updated and such. Just to test it out, does anyone know how to install the HP bios updates from a bootable cd? HP help site mentions something called ROMPaq, but it doesn't have clear instructions on how to use it. Just FWIW, I did in fact try flashing the DV5 with the DV7 F.21 BIOS. It wouldn't do the update. @Starcraftmazter : I've already been using bootable CDROM HP ROM Paq in professional enviromnent. My observations are that they seems to be bundled for one precise range of server and contain firmware updates for SCSI cards and disks, BIOS, netcards and many other components. One more thing to be noticed is that they seem to be linux based !! before it completes and it takes 1.5 times longer to go into hibernation and resume. But it does still work. Update for HDX 16 users: the recently released F.20A BIOS update does NOT fix this problem. All it does is update the firmware on the GPU for NVIDIA users. On a side note... Paul, thank you so much for all of your efforts!!! Same error on a dv5-1235dx recentrly buyed. I think this is fixed in the latest HP bios updates for the dv4, dv6, and dv7, released March-May 2009. I'd guess the corresponding dv5 update will be soon. > update will be soon. > not being to be re-mounted, but I haven't been able to capture those yet. > updates, on a reasonably new HP Pavilion dv5 (1075er) notebook. > version or hardware so I'm starting a new one. > models of HP laptop. >> update will be soon. >> not being to be re-mounted, but I haven't been able to capture those yet. >> updates, on a reasonably new HP Pavilion dv5 (1075er) notebook. >> version or hardware so I'm starting a new one. >> models of HP laptop. * Updates the Intel MRC Code to version 2.7. * Updates the Intel AHCI OP ROM to version iSrc 1.20_E.0012 11252008. * Updates the BIOS to support Microsoft Windows Vista Operating Systems with Service Pack 2 (SP2). So it seems we must wait a little longer still ... fingers crossed. How do you guys install the BIOS update? I guess I am not the only one here who completely deleted the Vista installation,thanks for help! > reboot. You can imagine how much of a pain this is on laptop! Thank you for contacting HP. feedback from our customers relating to Linux on HP products. Thank you for the information you supplied. I have just applied HP's F16A BIOS to my DV5-1000ea. This has solved the suspend/resume issue. A BIG thanks to Paul, TJ and all who took time to get involved. I've applied the latest update to my DV5-1138tx, and I can too confirm that sleep now works!! And to HP for finally fixing it, hehe. > A BIG thanks to Paul, TJ and all who took time to get involved. > On resume from suspend in Ubuntu 8.10 (Intrepid Ibex) the ATA driver throws a series of exceptions, as a result the filesystems can not be accessed and the computer needs to be rebooted. Hibernate, however, does work and does not have this problem, suspend / resume only. The linux kernel version is the latest 2.6.27-7. > * Update 16th of May 2009 * The problem remains unchanged under Ubuntu 9.04 (Jaunty Jackalope). > There are a variety of other error messages thrown about ext3 file systems not being to be re-mounted, but I haven't been able to capture those yet. > I'm running a fresh copy of Ubuntu 8.10 (Intrepid Ibex), with the latest updates, on a reasonably new HP Pavilion dv5 (1075er) notebook. > Originally I posted my problem under bug #158050 but later I realised that this was for an older kernel version. Then I thought that bug #273323 would be a better fit, but that has since digressed into a KDE discussion, entirely irrelevant to my problem. I've looked at every Intrepid suspend / resume bug listed and none are specific to my distribution version, kernel version or hardware so I'm starting a new one. > * Update 18th of May 2009 * There is also evidence, anecdotal and otherwise, to suggest that the same problem is present on HDX and some other models of HP laptop. > > the suspend/resume issue. > > A BIG thanks to Paul, TJ and all who took time to get involved. > > of the bug. > version is the latest 2.6.27-7. Big thanks to everybody ! > that sleep now works!! > And to HP for finally fixing it, hehe. I opened the link you posted, but it says that the BIOS update applies only to AMD-cpu-laptop! I have an Intel, what should I do?? In my case I have a Compaq Presario V5306US (Turion 64 processor) and problems persists. The Bios seems to be incompatible. Whats the idea on my case? Confirmed that this bios update resolves the problem on my HP DV5-1002nr - bios version F.33. Also, thermal sensors are now functioning finally. Hey jeiworth - I kept a small vista partition and so flashed the bios from there. I'm not so sure I'd attempt to run their installer in wine. Did you delete the recovery partition as well? I'm guessing yes... Perhaps you could get recovery disks and attempt to flash the bios from there. Perhaps someone else has a brilliant idea - it is quite annoying that the bios utility is a vista-only app. Fortunately, I kept my vista partition (i think this is a waste of hard drive). You can take your computer to HP warranty service if you deleted vista, but I think they will wipe out your disk, so be careful. They released a BIOS update for the HDX 16 that fixed it as well! I'm shocked that they responded on this... I never thought I'd say it, but kudos to HP's BIOS team! Also, thanks to Paul and everyone who contributed! Good luck to anyone who is still hanging on. New F16 BIOS confirmed working for HP dv5-1235dx running Jaunty 9.04!!! Thanks HP! CONGRATULATIONS to everyone that has had their suspend / resume fixed by this BIOS update! I'd like to encourage you all to contact HP Support with a "thank you" message. They have done the right thing and we should encourage them to continue supporting Linux users. Finally a big "thank you" to Tejun, who works on the Linux ATA driver, and to all of you, for your cooperation and community spirit! PS. If you have a NON HP Pavilion dXXXX/HDXxx laptop that is still experiencing suspend resume problems, my advice is that you start a NEW Ubuntu bug report. Get on the Ubuntu and HP forums, gather as much data as you can on the problem and petition HP, or whoever can help you, to fix it. Open source is about community ... in your face Microsoft! Thank You, Paul and everyone for their efforts. > I'd like to encourage you all to contact HP Support with a "thank you"
> continue supporting Linux users. > and to all of you, for your cooperation and community spirit! > fix it. Open source is about community ... in your face Microsoft! realize the truth...There is no spoon." I've similarly applied the new BIOS and it works perfectly. > Thank You, Paul and everyone for their efforts. >> I'd like to encourage you all to contact HP Support with a "thank you"
>> continue supporting Linux users. >> and to all of you, for your cooperation and community spirit! >> fix it. Open source is about community ... in your face Microsoft! I installed the F.16 bios into my dv5-1140el. Things works better now, but not flawlessy. -The resume takes long and an error message about my dvb-t card unable to find the firmware shows. Some errors about bluetooth show also. -I hear annoying and loud clicks coming from the speakers everytime i go up/down with the volume or use skype. This doesn't happen before resume. -Sometimes, the laptop hangs when trying to turn off after resume. Anyway, it looks like the "scratching" sounds that i heard when i turned off my computer are gone away. Thanks for your effort in solving this odyssey. I'd like to encourage you all to contact HP Support with a "thank you"
and to all of you, for your cooperation and community spirit! fix it. Open source is about community ... in your face Microsoft! Here attached there's what dmesg shows after resume. Kudos to HP for finally fixing this, even if they did take a while. Thanks Paul for spearheading this! applying it tonight to see if it resolves the issues I'm having. I'll report with my findings. HDX18(1080EG) with F.23 BIOS works flawlessly. Thanks to everyone! Not only does my DV5-1000ea now suspend & resume... The Remote Control has suddenly started to work! xev shows events happening when I press the buttons whereas before the Bios update, only the I0I button did something. I wonder what other lovely secrets are waiting to be revealed... ! I can confirm that the BIOS update solved the suspend/resume problem. And also the multimedia buttons (I don't know how to define them, my english doesn't reach so far...) at the top of keyboard are working a little better (before, changing the volume had become a really serious ability proof!). Now I'm waiting only for the cracking/static noise from speaker on reboot to be solved...any solution for that yet? I don't hear those static noises anymore, but i still have to test it well. I confirm that multimedia buttons seems to work better. The resume still takes about one minute, the first time. I suppose this is caused by the internal dvb card driver. I can confirm that the BIOS update solved the suspend/resume problem. speaker on reboot to be solved...any solution for that yet? I confirm that the crackling sounds on reboot are gone for me. My delay in resume is caused by the dvb-usb card. Removing the driver module speeds up the resume making it almost immediate. Does anyone know the solution? the driver complains about the firmware, but it is regularly loaded at boot. I also see messages about bluetooth on resume. Is any message shown at resume, for you all? I'll try to catch those messages and be more detailed. In contact with HP support center, I'd mentioned the case of DV5-1001xx above that was solved with new Bios version, to be used as reference for my case with Compaq Presario V5306US. Change drivers/usb/host/uhci-hcd.c:suspend_allowed() to always return 0 (don't suspend on uhci_suspend the but reset), usb seems to work after a suspend/resume with apm." For more detail. I request you to follow given below link. The question now is how to implement the change in Ubuntu 9.04. Does anybody could help with that? Thank you all for any assistance. And Paul Swanson did say unto Wollombi ... "Truly, 'tis the funniest post I've seen on this bug report"; and he did join in the celebrations and the feasting as resume did now also work upon his dv5! My dv5 finally feels like a laptop whilst running Ubuntu. Thank you HP (and everyone else. I've a HP dv5 1073ez and I've installed the last Bios update F16.A. The suspend now works correctly for me and I still have some cracking on reboot. However, my bluetooth module completely disappear from windows (device manager) and ubuntu 9.04 (lsmod). I think it's due to the BIOS update, but i'm not sure... so someone has the same problem since the BIOS update? work. It causes the hard drive to click in some kind of stuck loop. > I've a HP dv5 1073ez and I've installed the last Bios update F16.A. > The suspend now works correctly for me and I still have some cracking on reboot. Three (!) years after discovering this bug, I finally took the time to unplug my hard drive, install another hard drive, install this marvellous OS : windows vista, then run the HP bios updater. Suspend and hibernate are working smoothly. Displaying first 40 and last 40 comments. View all 220 comments or add a comment.